Explore the prehistoric world! Meet more than 25 dinosaurs, and discover that science is everywhere as you travel through the eras to bring about a dinosaur family reunion. Discover what they liked to eat, when they lived and more! Go back in time with Leap, Professor Quigley and their adorable dinosaur friend Zoey to find her family and learn about the prehistoric world! Dig up fun facts about dinosaurs, and learn about scientific tools, measurements, adaptations, classification and more! Explore the prehistoric world! Meet more than 25 dinosaurs, and discover that science is everywhere as you travel through the eras to bring about a dinosaur family reunion. Dig into fun fossil facts from prehistoric times. Become a dinosaur expert with 15 interactive playing cards. Study cool tools and develop early science skills. Explore the prehistoric time line, from the Triassic to Cretaceous period. General information: Size H28.9, W17.4, D1.1cm; For ages 4 years and over; EAN: 708431212190. * 7493445 11.84. This toy costs approximately £12.99 (for the latest and best prices make sure you check our retailer list for the The Lost Dinosaur Tag Book above). 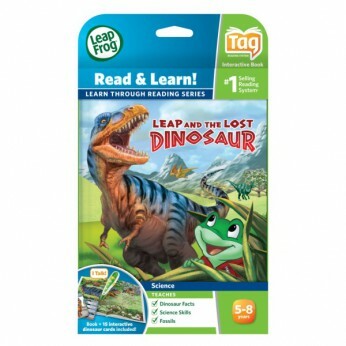 In our review of The Lost Dinosaur Tag Book we classed it as being suitable for ages 3 years, 4 years, 5 years but recommend you check the manufacturer specific advice before purchasing.